My patient came to me for a second opinion. Her tooth had been previously treated, and now she was having pain when she bit down. 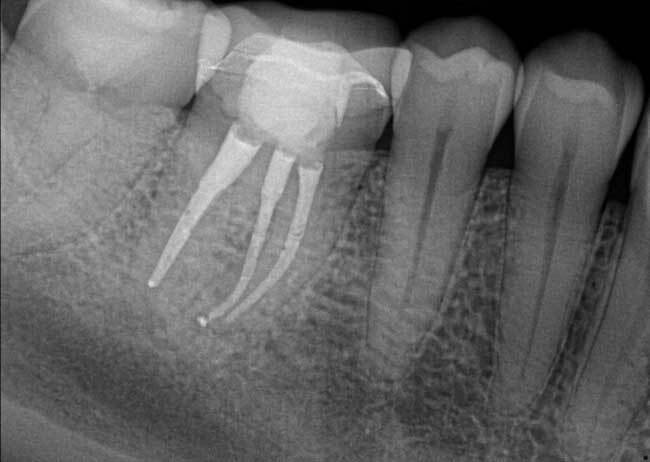 She had been previously diagnosed with Symptomatic Apical Periodontitis. 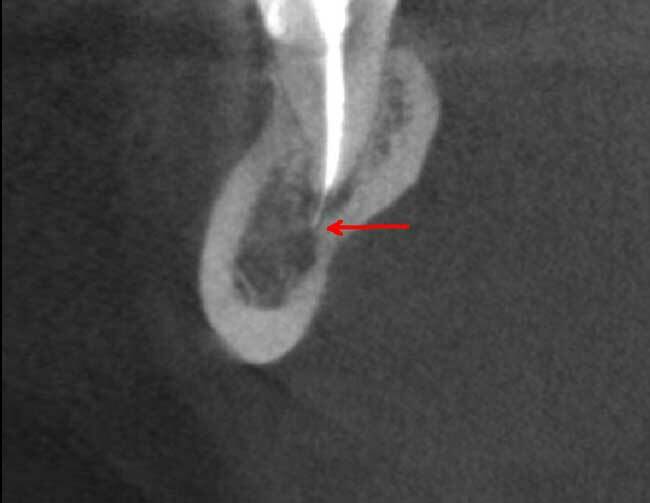 She’d already been to an endodontist, and they had told her that there was nothing that could be done to save her tooth. Most patients would say, “Okay, extract my tooth,” but not her. She didn’t accept that answer and sought out another opinion – mine. I welcomed her into the office and learned she’d had a root canal several years ago. 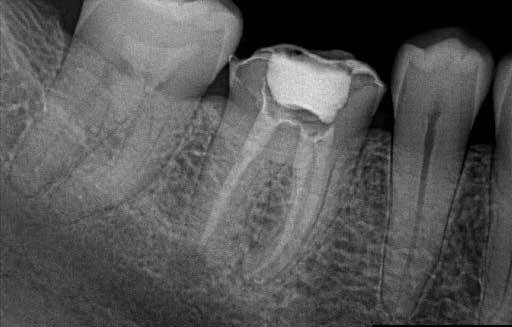 The root canal filling was overextended by about 5mm. 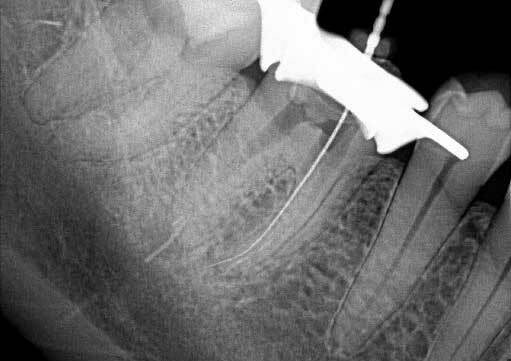 This overextension was also very close to the inferior alveolar nerve. You can appreciate just how close in this image here. If surgery had been the treatment of choice, there definitely would have been a risk for paresthesia. But surgery was not first on my list. I was completely transparent with my patient and let her know all of the possibilities and risks. I told her that I have gotten out overextended gutta percha before, but it wasn’t a guarantee that I could do it in her case. I also was not convinced that the overextended gutta percha was the cause of her pain. With all of the information in front of her, she made an informed decision and asked me to try. I cleaned out as much gutta percha as I could and got a working length. I then took a 40 hedstrom file to the apex, engaged it slightly and gave it a yank, and viola…that little “tail” came out! The dance party that occurred in that operatory was incredible! My patient, assistant, and I were all so happy we had accomplished the one thing the patient was hoping for. However, that wasn’t what had the power to make or break the case; it was the bacteria that was present in the entire length of the canal that would. It was at this point that I confirmed that surgery was not a good first option. 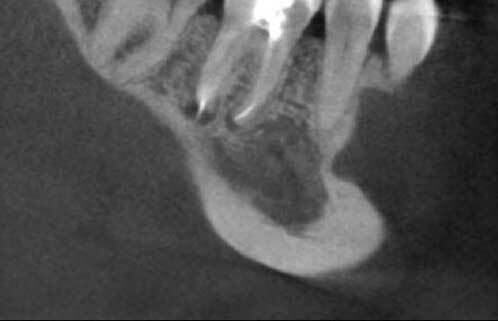 Sure, it would have removed the overextended material, but it would have done nothing to clean the bacteria out from the rest of the tooth. 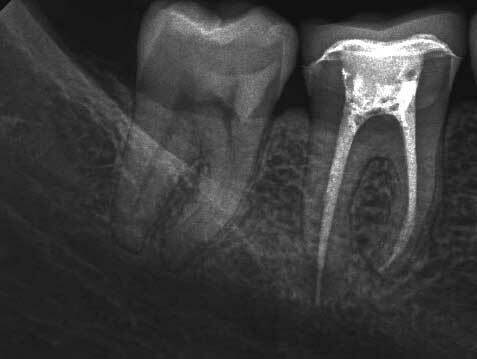 My patient would’ve had short-lived success, since that tooth was BLACK inside. Thank you calcium hydroxide for taking care of that! By the time she came back to obturate the tooth, she was pain-free. Once again, making the right diagnosis is crucial. When I understood that it was the bacteria that was causing the symptoms, and not the extra-long gutta percha, then I was able to approach the case appropriately. It’s very important that you, as a dentist, take the time to ensure the patient has the same understanding of what is causing their pain as you do. The answer isn’t necessarily what looks obvious on the radiograph; take your time and follow the clues to place the blame for the pain where it should be. You don’t know what you can do for your patient until you try. Don’t give up too quickly! Extraction is not always the answer. Talk with your patient with transparency about the possible outcomes of treatment. This allows your patient to make an informed decision about their own health. 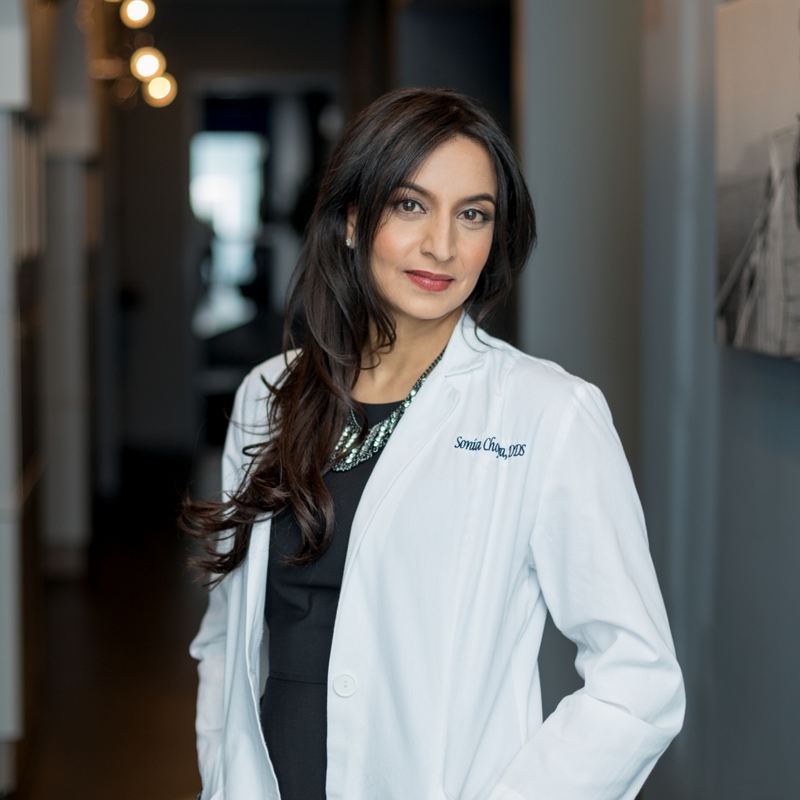 Thank you Dr. Tarun – more to come! Very nice!!! This gives me hope to try removing overfills again. I had given up doing it several years ago because it just seemed too difficult. Did you use any chloroform to soften the gutta percha or just go after it with the hedstrom file? Yes, I used some chloroform, but not too much. Just enough to soften my gutta percha so I can engage my file into it, then I quickly remove the file from the canal.